Adrian at 250-816-3806 or by email at NanaimoCob at gmail dot com anytime for a prompt, FREE, on-site consultation at your convenience. Cobbing doesn’t get any easier than at this 3 day Cob B&B (Build-and-Bake) Workshop, from September 26th to September 30th, 2013 on Lasqueti Island. We’ll spend the first 2 days learning how to build a beehive oven out of cob and sculpt a Froggie out of an existing oven, then we’ll learn how to use it and indulge in tasty treats as Master Baker Nadine Simpson shares her recipes and skill. This workshop is especially suited for those living in an urban or suburban area and want to learn everything there is about natural building in as short a time as possible. You'll practice making Appa's Fast Cob, learn how to make a natural, durable plaster, and be able to make yourself an oven that bakes exceptionally well. You’ll arrive on Thursday, September 26th, pitch your tent and settle in for a welcoming dinner. The next 2 days we’ll build an insulated beehive oven. You’ll get an understanding of how to mix and use cob, an ancient building technique that is not only dirt cheap, it’s insect, rodent, earthquake and fire proof. 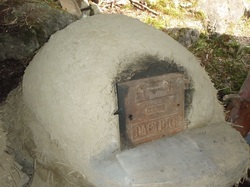 Plus, you will mix and use natural plasters to hand sculpt an existing oven into the shape of a frog. discuss baking practices…mise en place, equipment, tools etc. learn about using the oven for roasting vegetables, and other oven cooked meals. Then, on Monday, September 30th, we’ll share our farewell breakfast and depart. The cost of $350 covers all meals (3 hot vegan/vegetarian meals for 3 days, plus the welcoming dinner and the farewell breakfast), on-site camping with running water, and hands-on instruction for both making and using a cob oven. An early bird discount of $50 per registrant is available for those who pay in full before August 1st, 2013. Any two people who register together (after the early bird discount period) receive a $50 discount (i.e., $650 for two spots). Previous participants receive $50 off each workshop. A person is considered registered and a spot is held for you only after an application is submitted and a minimum deposit of $100 is paid. Women and families are especially encouraged to apply. Barters or trades are always possible.